Cataracts are part of the normal aging process. We say a cataract forms when the natural lens of the eye becomes clouded. The cause is usually unknown but can result from exposure to ultraviolet light, injury, heredity, disease and advancing age. In the early stages of cataract development vision can usually be improved by changing your eyeglass prescription. We recommend that patients with cataracts see their eye doctors every six to twelve months to monitor their vision and “fine tune” their prescription. A cataract is removed using microsurgical techniques. A small (3.0 mm) incision is made into the eye. This incision is so small that, in most cases, it is self-sealing and sutures are not required. The most advanced technique for removing a cataract is called phacoemulsification. In this procedure an ultrasound probe is placed into the cataract. The probe vibrates at a very high speed (20,000 to 40,000 cycles-per-second), which breaks the cataract into many tiny pieces. The pieces are removed using aspiration through a small tube. Once the cataract (clouded lens) has been removed it is replaced with a new, clear lens. 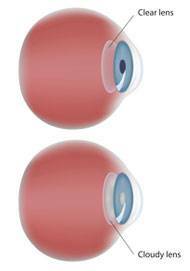 This lens is called an intraocular lens implant. The implant (with a diameter of approximately 6 mm) is folded in half and then inserted into the eye through the original (3 mm) incision. The implant enables patients to see well without having to wear thick, heavy eyeglasses. The cataract procedure is most frequently performed under local anesthesia in an outpatient surgery facility. It does not require a stay in the hos pital. Sedation is given to most patients to help them relax. The procedure is performed in about 30 to 45 minutes. Thanks to the anesthetic, patients do not feel or see the surgery. Cataract removal with insertion of an intraocular lens implant is performed over one million times each year in the United States. It is one of the safest surgical procedures known to modern medicine. As with any type of medical procedure there is always the possibility of complications. The rate of complications is extremely low.